The 2016 New York Baby Show, (which New York Family produces) which took place on May 14-15 at Pier 92 in New York City, introduced thousands of new and expectant parents to a variety of products and services in the baby and maternity realms. We also had a prestigious panel of judges on hand—all from leading publications and organizations in the parenting world—to select this year’s Best in Show Awards. As you’ll see for yourself below, the five winners and 16 honorable mentions are notable for their variety and excellence. Our expert judges included Maria Colaco of TTPM, Megan Colarossi of the “Meredith Vieira Show” and TODAY.com’s “Parental Guidance” with Willie Geist, Natalie Diaz of Twiniversity, Nicole Feliciano of Momtrends, Debra Flashenberg of the Prenatal Yoga Center, Tracey Frost of Citibabes, Eddie Geller of Tinybeans, Rebecca Gruber of POPSUGAR, Rory Halperin of Mommy Nearest, Maura Hohman of Everyday Health and WhatToExpect.com, Joanne Hirkaler of Gymboree Play & Music Manhattan, Suzanne Kantra of Techlicious, Kira Kohrherr of FitBump, Jane Morales of the Mamas Network, Jessica Pallay of Well Rounded NY, Matt Schneider and Lance Somerfeld of NYC Dads Group & City Dads Group, Bobbie Thomas of the “TODAY” show, Adam Woodman of Pregnancy and Newborn magazine, and Mary Ann Zoellner of the “TODAY” show and the Sh*tty Mom series of parenting guides. 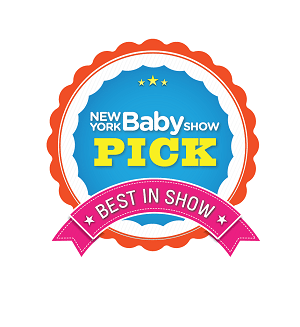 Additionally, we are pleased to present our first-ever Blogger Favorites list from the 2016 New York Baby Show! This year, the Show was attended by over 75 bloggers from the pregnancy, baby, toddler, and family space. The bloggers in attendance (see list below) chose favorite products that they posted about on their websites and across their social media channels. The following seven products are the items from the Show that received the most blogger votes! Our bloggers include 3CITYGIRLSNYC, A Child Grows, Apple Moms in the Hudson Valley, Baby Does…NYC, babydroppings, BabyGotChat, BabyNav, Beauty and the Bump, Bebe To Bee, Being Mom in NYC, Betsy V, Blissfully Domestic, Brown Media Mama, Bronx Mama, C’est La Vie, day to day MOMents, Dellah’s Jubilation, Debra’s World, the Digital Latina, the Examiner, Fab Gab Blog, FamiliesGo!, FashionAveMom, FiDi Families, For The Love To, Grits in the City, the Huffington Post, If You Seek Nutrition, InBliss01, Jersey Family Fun, JUSTABXMOM, Latina on a Mission, Lights Plus Heaven, Luna Mommy Vlogs, Mama Glow, MamÃ¡ XXI, Mami Does It All, Massapequa Family, the Mint Chip Mama, Mom In Love Forever, Mommy Delicious, the Mommy Factor, the Mommy Elf, Mommybites, Motherburg, MidgetMomma, Mrzmomof3, New Mommy Bliss, Niecyisms and Nestling, NYC on the Cheap, Project Nursery, Saving with Denise, School Yard Style, the Shopping Mama, Sueannette’s Blog: My Journey in Parenthood and Life!, thebrooklynmom, TheNewYorkMom, Thirty Mommy, Tootsies & Paws, TwinDOllicious, US Japan Fam, VeggieMom, the Very Best Baby Stuff, W42St Magazine, and Yoli’s Green Living.